Are you tracking your ROI from your email, social media, and advertising campaigns? Loaded question, I know. But, it is essential to measure the impact driven by all your marketing efforts. Especially the campaigns that drive visitors back to your website. 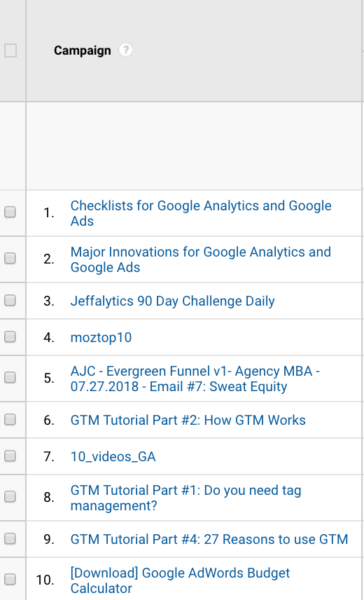 Fortunately, Google has made it possible to track the results from your digital marketing efforts inside of Google Analytics using their built-in campaign tracking platform. And how much revenue each campaign produced! The best part about campaign tracking? It’s not very difficult to set up, once you get the hang of it. Moreover, when you put a campaign tracking system in place, you can use Google Analytics to see how every one of your emails, social media messages, and paid advertising placements performed for your organization. Ready to start measuring the effectiveness of your marketing campaigns? Follow the steps in our post below and download our campaign tracking checklist. Our checklist will provide you with a repeatable process to set up and evaluate your campaign tracking. ☐ Create UTM’s for your campaigns. UTM stands for Urchin Tracking Module. This name comes from the Urchin analytics platform Google acquired when they first launched Google Analytics. The origin of the term UTM isn’t exactly essential knowledge anymore. But as long as we are on the subject, I thought I’d share a factoid that can use in your next game of web analytics trivial pursuit. The practical purpose of UTMs is to send information to Google Analytics about where your campaign traffic came from and how that traffic reached your website. You can create UTMs for the web links in your campaigns using Google’s URL builder. Many marketing systems like Drip and Buffer will automatically tag your links with UTMs inside their platform. 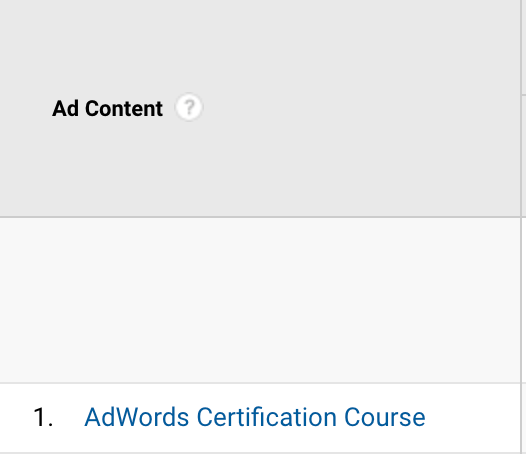 If you’re using the Google Ads platform to drive paid traffic to your site, and you enable auto-tagging, Ads will also automatically create your UTMs. ☐ Make sure your UTM fields follow the correct syntax. The campaign field tells Google Analytics the name of your marketing campaign. The content field allows you to tag your paid advertising campaigns with the ad text that you’re using to drive traffic. The term is the keyword that triggered your ad and sent you traffic from your paid search advertising. ☐ Use campaign naming conventions that clearly define the source and medium. 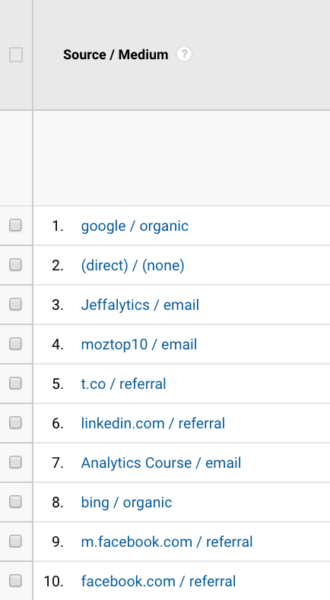 Your source, medium, and other UTM fields allow you to identify your campaigns in your Google Analytics reports. 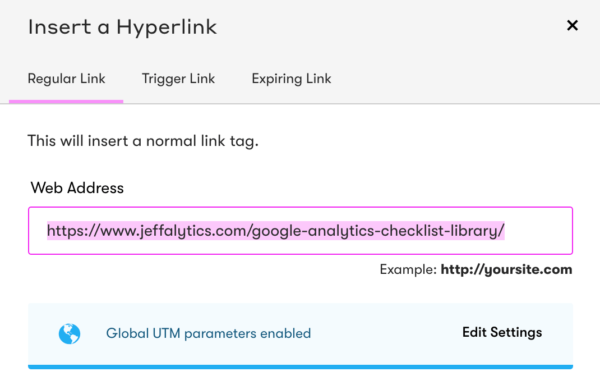 When tag your campaign links with UTMs, try to make sure the data you’re sending into Google Analytics is easy to understand in your reports. You want to use campaign names that are descriptive and easy for your team members or clients to understand. 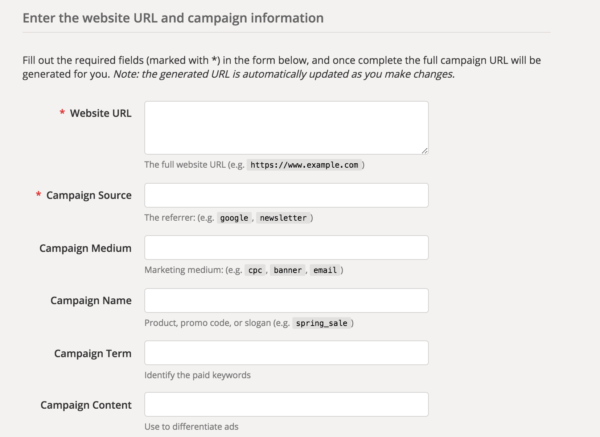 ☐ Create a spreadsheet to log your campaign data with your UTM tagged URLs. It’s a good practice to log each of your campaigns, along with your UTM tagged URL in a spreadsheet. 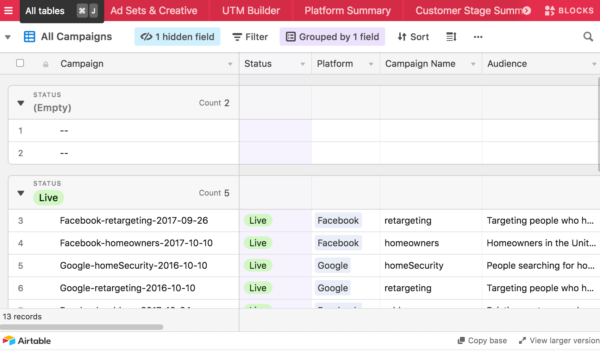 There are services like Airtable that offer campaign tracking templates. Or, you can use a software service like campaigntracker.io to keep track of the campaigns you’ve created. ☐ Create a calendar for all your marketing campaigns. Linking your campaigns to a calendar will help your marketing team and clients see all the activities that are being taken to drive traffic to your website. A campaign calendar can also help your team understand when they should expect to see campaign results, and when to review campaign performance. Services like Salesforce and Smartsheet offer campaign tracking calendars you can use if you don’t want to build your own. ☐ Make sure your entire marketing team has access to your UTM builders, campaign spreadsheets, and your marketing calendar. Giving your team access to campaign resources, and training them how to use these resources will support a unified effort. Training your team in how to use campaign tracking will also provide them with a better understanding of how to make data-driven marketing decisions. 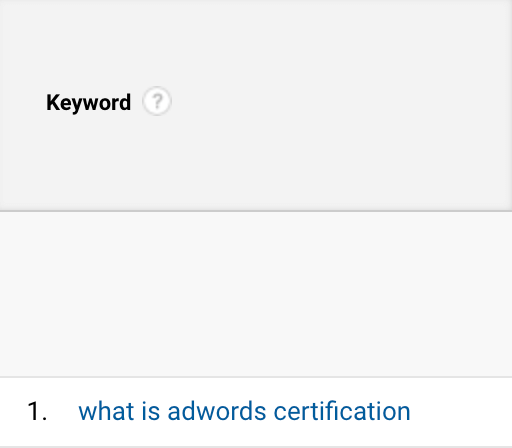 ☐ Use the term (utm_term) field in your URL builder to add keyword data to your UTMs for cpc campaigns. If you’re doing paid search marketing, keyword data is critical to evaluating your results. The more you can get the better. So make sure you’re using the term field in your UTMs. ☐ Use the content (utm_content) field in your URL builder to make sure your paid media campaigns are attributed to the ad text used in that campaign. Sending your ad text from your paid advertising campaigns into Google Analytics will make your camping reports more complete. ☐ Define your targets for every campaign (i.e., clicks, CTR, conversions, engagement metrics, revenue, etc.). Building a marketing campaign without a goal is like flying a plane without a destination. Without an objective, you’ll just burn through resources, without making any real progress. Even if your targets are simple (for example, 5% CTR, $1000 in sales, a 10% increase in sessions), make sure you identify them. Your marketing team needs to know the short and long-term objectives of your campaigns so they can aim for your targets, and measure their progress. 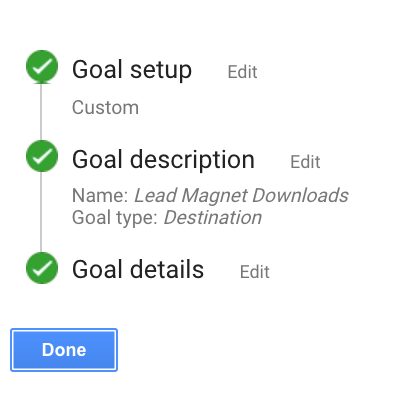 ☐ Set up Goals in Google Analytics to work with your campaign tracking. You won’t be able to measure the real value of your campaigns without using Google Analytics conversion tracking. So, try to put goals in place before you launch your campaigns. And be aware that you need to send your campaign traffic through pages that are tagged as conversion pages (i.e., “thank you,” “success,” or “purchase” pages) in your goals. Turning on your goal funnels will allow you to see the paths your visitors take to convert within your campaigns. Analyzing goal paths can help make your campaign targeting much more effective. ☐ Enable your demographics and interest reports in Google Analytics if you want to be able to analyze demographic data from your campaigns. Using campaign tracking with Google Analytics demographics will allow you to use segments to build customer avatars or create audience cohorts. ☐ Create (or import) a campaign tracking dashboard in Google Analytics. Make sure your marketing team has access to this dashboard. 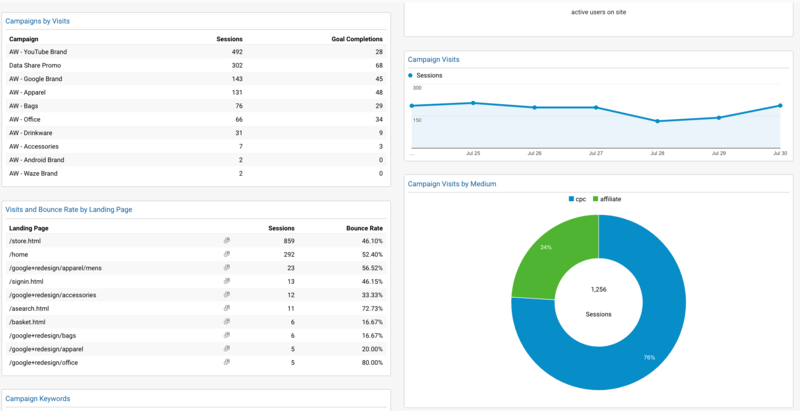 Using a dedicated campaign tracking dashboard is a quick way to check in on your campaign performance routinely. For those of you who are already using campaign tracking, let’s talk about how to review your current campaign tracking process. Here are some things to consider when auditing your marketing team’s campaign tracking. Are you using UTMs in every email you send that includes links to website content? Are you using UTMs in every social media post that contains links to website content? Are you using UTMs in every paid media placement (i.e., Google Ads, Bing, Twitter, LinkedIn, etc.) that drives visitors back to your website? As we discussed earlier, UTMs are the foundation of campaign tracking. You can’t get data about the results of your campaigns without UTMs in your hyperlinks. So, whether you’re using an automated system or a manual process, make sure you add UTMs to all your campaign links. Do you review your campaign performance? Are the results of your campaign analysis disseminated in clear, easy to digest reports throughout your team? Are your campaign links and reports accessible from your campaign tracking calendar? The purpose of campaign tracking is to measure results and make incremental improvements. Your marketing team can’t improve your outcomes if they don’t know how they are doing. Make your campaign tracking reports accessible and try to use your campaign reports to gain strategic knowledge. Your campaign reports should help you tell the story of your audiences’ journey from your marketing messages to your website. Now let’s talk about how to make sure you’re sending quality data into your campaign tracking reports. You can start evaluating your data quality using your Source/Medium report. Is your “direct” traffic percentage less than 20%? Direct traffic of more than 20% could indicate a lack of campaign tracking or problems with your campaign tracking process. Are your referrals showing up accurately? Is there is a dominant referral source in your Source/Medium reports? If you see one referral dominating all your campaign traffic, consider using UTMs to isolate your referrals further. 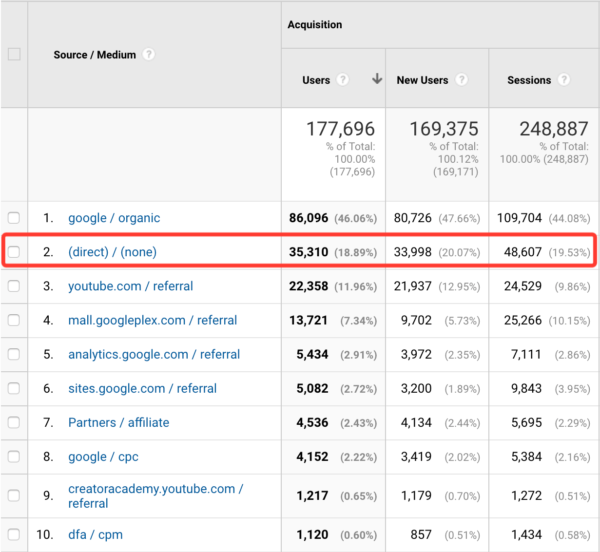 Are there referrals from advertising platforms in your source medium report? If there are, add UTMs to your paid advertising links. Is there consistency in your source names? For example, Facebook vs. facebook, or ppc vs. cpc. Consistency is key with your source/medium names. Is there NO significant presence of “(not set)” data in your source/medium report? If there is, the cause is likely to be a miss-tagged link that’s missing a key UTM parameter. Identify the link and fix the link using the Google UTM builder. Next, review your campaign reports for data quality. Do your campaigns names make logical sense and are they easy to understand? Is there NO presence of “(not set)” data in your campaign names? Are your paid campaigns accurately reporting keyword data? Evaluating your campaign reports for clarity and accuracy will help make sure your campaign tracking remains a valuable asset to your marketing. Almost every business uses email and social media to connect with customers. And many companies also use paid advertising to drive traffic. Without tracking the results from these efforts, you can’t figure out what’s working and what’s not. Google Analytics provides you with a complete and easy to use platform for tracking all your marketing outreach efforts. Take advantage of it! Do you have questions about campaign tracking? Leave a comment with your campaign tracking questions. I’ll answer your questions in the comments. 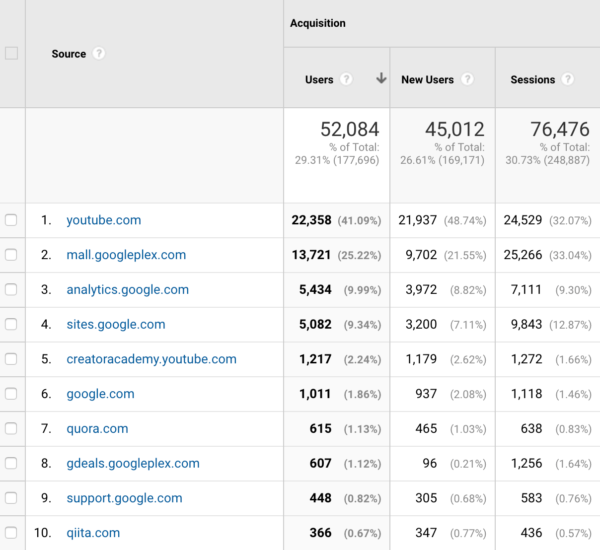 And I might even pick a handful of questions to answer in our upcoming Google Analytics campaign tracking video.